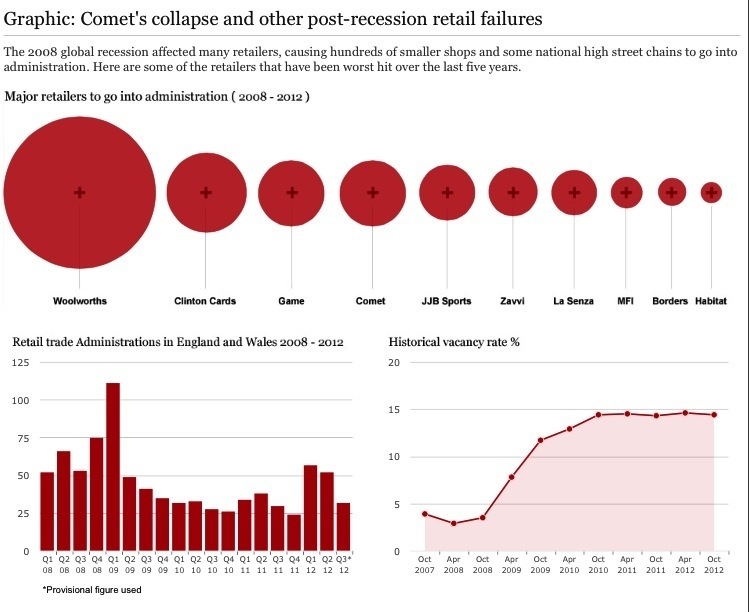 The 2008 global recession affected many retailers, causing hundreds of smaller shops and some national high street chains to go into administration. Here are some of the retailers that have been worst hit over the last five years. The electrical retailer’s 79-year history comes to an end today, as stores close for the last time. Up to 6,000 employees have been made redundant, meaning the government will have to pay £23.3 million in compensation. The company has debts of £233 million which is owed to dozens of unsecured creditors, and over £26 million is owed to HM Revenue & Customs (HMRC) which won’t be paid. The company was founded in 1933 and started off selling radios and batteries. ‘Woolies’ had almost 30,000 employees when it closed in November 2008. The familiar British brand was one of the biggest to go bust after administrators Deloitte & Touche closed all 807 stores in just 10 days. On 5 December, Woolworths cut 450 head office and support staff jobs while on the same day recording their biggest ever takings of £27 million. The figure wasn’t enough to service the company’s £385 million debt, however. As of January this year, up to £67.8 million in compensation was awarded to more than 24,000 former Woolworths workers, ending a three-year battle in the courts. Over 8,000 employees were working for the British card retailer when the group’s £35 million debts were bought out by American Greetings, it’s biggest supplier, in May this year. Clinton had been suffering increasing competition from supermarkets and online retailers such as Moonpig.com, which sell personalised greetings cards. At the point of administration, the group operated 628 Clinton and 139 Birthdays stores. Most of the 8,000 employees were working in-store, with many working on a part-time basis. The High Street video game retailer had almost 6,000 employees working in over 600 stores when it went into administration in March 2012. Private investment firm OpCapita set up a company called Baker Acquisitions to buy 333 stores. Administrators PricewaterhouseCoopers (PwC) informed over 2,000 staff that they were to be made redundant. The company had faced stiff competition from online rivals. At the point of administration in October, the sports retailer had 4,000 employees on its books, working in 180 stores. The rise of its main rival, Sports Direct, put the boot into JJB’s sales figures, along with longstanding debts that totalled £100 million in 2011. 550 jobs were saved after administrators KPMG sold the website and 20 stores to Sports Direct, but the remaining 133 JJB stores were closed immediately, and about 2,200 staff were made redundant. Before being placed into administration in December 2008, Zavvi was the UK’s largest independent entertainment retailer. At the point of administration, 3,400 employees were working across 125 stores for the company, which had problems with its supplier. Rival HMV’s share prices rose as it was the only major high street entertainment retailer left, and online retailer Play.com reported a 24 per cent profit increase over the Christmas period, which is put down to Zavvi’s collapse. 2,600 employees worked at 146 stores when La Senza entered administration in January 2012. 60 stores were saved by the Arab firm, Alshaya, along with 1,100 jobs. The British furniture and kitchens giant was the first casualty of the global recession. After negotiations failed over MFI’s wish for a three-month rent holiday, on 19 December every one of MFI’s 111 stores across the country were closed along with the loss of 1,200 jobs. Borders UK became independent of its US parent company in 2007 and commanded around 8% of the retail book selling market. The company announced in November 2009 it was looking for a buyer and by the end of the month the chain had announced it was going into administration. All 45 stores were closed and 1,150 staff were made redundant. Around 750 employees were made redundant on 11 September 2011 after Habitat’s owners, Hilco, closed all of the remaining stores apart from three Central London ones. Approximately 100 staff remain at the London stores and 50 in head office.